Even after the travel bans, it was pretty easy for me to stay focused. I knew from the beginning, how badly I wanted to go wrestle that type of top-tier competition, so nothing was going to sway my decision very easily. Ultimately, I felt extremely confident that we were going to end up wrestling in Iran and I continued to prepare that week as if we were leaving to go compete. The competitors in my pool consisted of Dato Marsagishvili, Georgia, who was a World and Olympic Bronze medalist (watch), Vladislav Valiev, Russia, who was a Jr. World Champion and just placed 3rd in the Yarigin (watch), Sharif Sharifov, Azerbaijan, who was a World and Olympic Champion and an Olympic Bronze medalist (watch), and Hassan Yazdani-Charati, Iran, who was the returning Olympic Gold Medalist at 74kg (watch). I have felt a lot of people have doubted my ability to compete with that level of competition, and at this new weight class, so I was even more excited for this opportunity to test myself against the best guys in the world. While some might view that draw as adversity, I viewed it as an awesome opportunity. 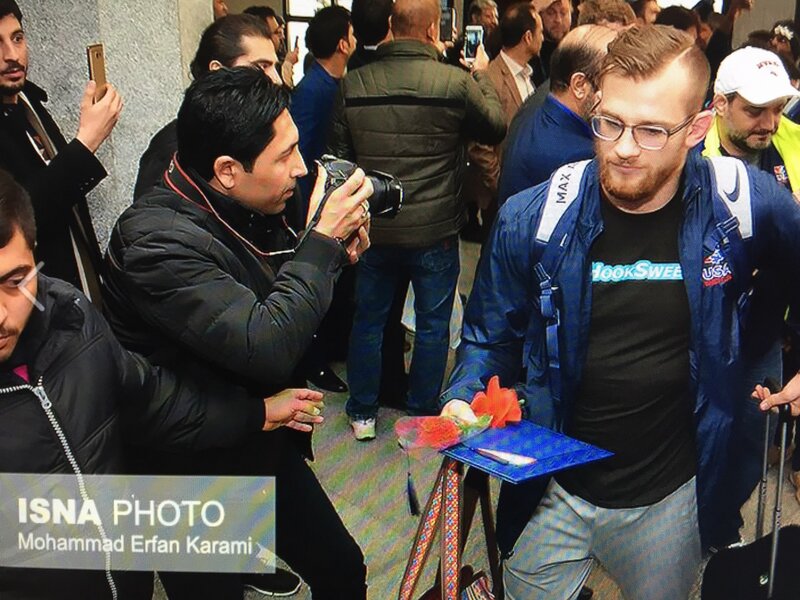 Iranians love their wrestlers and they showed up in force! Many people have asked me, “how I manage the crowds?” I have been exposed to wrestling in front of sold out crowds at Rec Hall dual meets, Big Tens, and NCAAs, so for me this was just another awesome opportunity to go out and do what I love to do. As the tournament progressed, I felt like the fans began to show me a lot more appreciation for and love for the way I was wrestling and scoring points. Being able to wrestle after Jordan Burroughs was also really exciting. It was a pretty cool experience being able to wrestle right after the legend himself and seeing how excited the fans get for him. It really pumped me up and reminded me of the dual meet days at Penn State. Over the last six months I have really started focusing on and making my nutrition, strength, and conditioning a top priority in my training. I have realized more recently, that all of those areas have to gradually be progressed and I can’t just focus on one area, or another one will lack. Something else that I feel really helped my conditioning, timing, and speed, actually started after I spent the summer watching and being around Kyle Snyder. Seeing how much he focused on stance and motion, and how it translated to his competition, is something that I began spending a great deal of time on before and after practice. I have always had pretty good conditioning, but the time spent on my strength with the Treigning Lab has given me so much more confidence, and I feel like I am the most well-rounded I have ever been. So, looking back on my performances, it was promising to see all of the hard work paying off. I was able to maintain an intense pace throughout the second period, which was where I was able to gain an edge and wear down my opponents. It was awesome being able to cap off the trip with a pin against 2016 Olympic Champion, Hassan Yazdani when the team needed a win. I felt that match was a good indication of where my conditioning is right now, and I know that it is only going to continue to improve as I get ready for the U.S. Open and World Team Trials. Overall, the World Cup was a great weekend. My goal this year was to get as many matches in as I could at 86kg, to really test myself and get international experience. So basically my schedule has been train, compete, recover, train, compete, recover, etc. I am looking forward to having some time back with NLWC, to really be able to focus on fine tuning and improving my wrestling skills, strength, and conditioning in preparation for the U.S. Open.